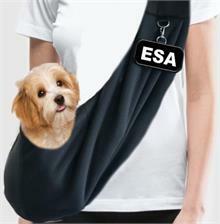 IDENTIFICATION: EZ-SLING™ carrier includes a removable clip on "SERVICE DOG" tag. CONVENIENT: Thanks to the hands-free design its incredibly convenient when traveling through an airport or simply shopping in a mall. SAFE: Our small Service Dog carrier will protect your dog in the heat of the summer when the pavement is dangerously hot and in the winters ice and snow. SECURE: This carrier holds your small Service Dog easily and features a safety collar hook to ensure your dog is safe and secure. CARE: This sling should be hand washed and air dried due to the metal attachment ring. Service Dogs, in general, are meant to be on the ground walking next to their handler. There are few legitimate reasons why a dog should either be in a carrier or be carried. Below is a brief explanation of that exception according to the Americans with Disabilities Act. All products offered by Working Service Dog are meant for legitimate Service Dog owners.